I have maintained for nearly six years now that e-cigs have the potemtial to show the tobacco control crusade up for the lucrative snake oil vending machine that it is, but even I didn’t envisage them to cause dull-witted anti-smoking politicians to jump the shark in spectacular fashion. With the UK government’s public health body reporting that passive vaping (ha!) poses “no concerns” and contains “negligible levels” of nicotine – about the only substance which could be classed as even remotely worrying – here we have Welsh Labour actually making it illegal to use them. In your own home. Alone…. The longer the saga of Mark Drakeford’s ridiculous plans to ban ecigs in enclosed public spaces, the more absurd his ‘evidence’ and plans become. So much so that even the most fervent Labour AM must surely now be questioning the wisdom, if not the sanity, of the Health Minister. Because all the evidence in the UK works against his proposals, he chooses to use (discredited) studies from the USA to try and shore up his plans. Even last week he was at it again, using discredited USA studies as ‘evidence’ to back his stance…. Vaping is not smoking. Vaping is indeed the most effective way to quit or at least cut down on smoking. According to ASH Wales, there are around 1000 ecig users in Wales – and all of them ex-smokers! The latest study from Yale University shows that banning the use of e-cigarettes can actually lead to smoking conventional cigarettes. The Welsh Government continuously fails to recognise the health benefits that come from vaping. The sad thing is that their blind obstinacy to obvious will only affect those who simply want to give up smoking. Well known ecig lover Simon Capewell is tweeting this morning with a link to the EU’s E-cigarettes Myth Buster – a pretty document clearly designed to persuade us that all those nasty stories you hear about how the TPD is going to destroy vaping as we know it, simply aren’t true! I think its worth doing a bit of myth-busting of this myth buster as there are a fair few half-truths, lies and a plain bs contained therein. THE plumes of vapour grow larger and thicker as Matt Gluggles demonstrates his array of e-cigarettes. Mr Gluggles, owner of the E-cig Wizard shop in Goodramgate, York, is showing off the devices he has spent an estimated £2,000 on since deciding to quit smoking four years ago. His varied collection ranges from the first generation “cigalikes”, which emulate the look of a cigarette, up to a third generation gold and titanium device costing the owner around £200…. Today’s E-Cigarette Summit at the Royal Society in London will no doubt offer further evidence that vaping is a safe activity, that it could save lives through smokers switching to e-cigs and that vaping does not act as a gateway to smoking. But underpinning the whole conversation will be the assumption that the views of public-health professionals and anti-smoking campaigners should determine the choices available to people who enjoy nicotine…. 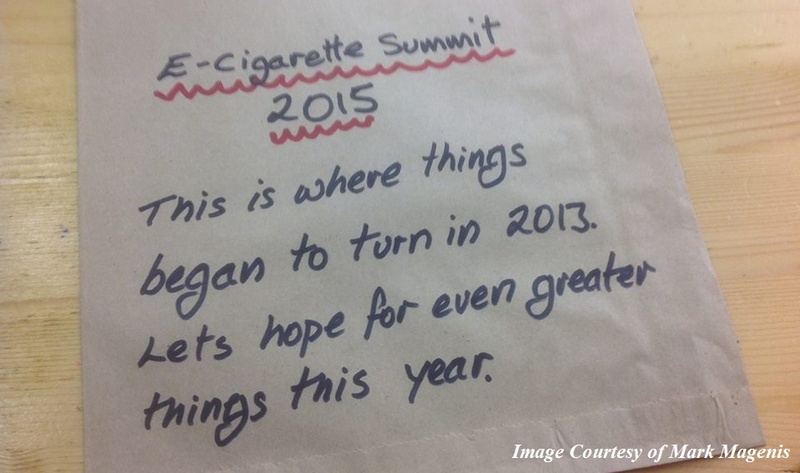 I went to the first one, two years ago, and wrote about it here (The E-Cigarette Summit: another view). I was quite positive. Last year I considered going again but when I looked at the list of speakers it was pretty much the same as the year before and heaven knows there are only so many times I can listen to Deborah Arnott without jumping off a bridge. There are several medical implications for smoking cessation especially when long-term high-volume consumption is ceased. Today, in 2015, we tend to think of a 1PAD (one pack a day) habit as significant. Average consumption is currently (2015) reported as around 12 – 15 cigarettes per day by smokers in the UK. What appears to be, currently, the most comprehensive listing of symptoms associated with smoking cessation can be found here.. The CDC has come out with the results of a study on e-cigarettes, and the outcome proves that everything vaping advocates like myself have been yammering on about for years is true. The results are also directly opposite of what the politicians and public health officials leading their quixotic charge against the vaping industry argue. In the near future, all 1.2 million American households residing in public housing units may be banned from smoking tobacco indoors – but the now-commonplace proposed regulation is inflaming passions, with the Department of Housing and Urban Development threatening to include e-cigarettes in the ban.